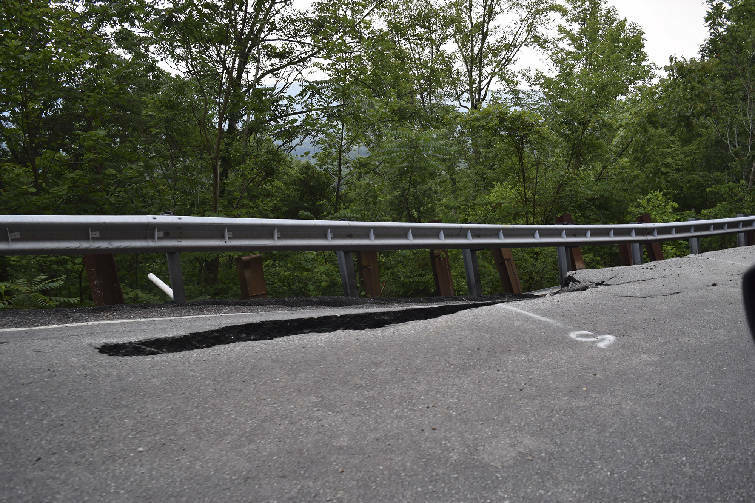 Severe damage from settling along a stretch of Tennessee Highway 30 between Pikeville and Fall Creek Falls will force closure of the road starting next week and continuing through the end of July while crews make repairs. One lane is already closed and temporary signal lights control traffic flow up and down the mountain. Repairs should be complete by Aug. 31, according to the Tennessee Department of Transportation. Traffic on State Route 30 north of the closure will be rerouted onto State Route 30 West to Spencer and then onto State Route 111 South to Dunlap then onto U.S. Highway 127 North toward Pikeville. Traffic south of the closure will be rerouted onto U.S. 127 South to Dunlap and then onto State Route 111 North to Spencer and then onto State Route 30 East toward Pikeville. Motorists and vacationers can get the latest construction activity updates at www.TNSmartWay.com/Traffic or call 511 from a land-line or cell phone for travel information. PIKEVILLE, Tenn. — Part of one of the east-west routes to Tennessee's popular Fall Creek Falls State Park will be closed from Monday until late July while crews repair a large section of collapsing pavement at the mountain's bluff line. Until Monday, temporary signal lights at the top and bottom of the work area will control traffic using one lane. Afterward, other routes will have to be used, according to Tennessee Department of Transportation spokeswoman Jennifer Flynn. One lane should be reopened by Aug. 1, and the project is expected to be finished by Aug. 31, she said. The state agency on Thursday awarded a $1.6 million emergency contract for the repairs to Dement Construction Co. out of Jackson, Tenn. The stretch of road at the 7.5-mile mark going up the mountain on Highway 30 from U.S. Highway 127 has a history of many repairs. "We are constantly monitoring this section of State Route 30, which because of its location on the side of a ridge, is prone to settling and slope failures," Flynn said. "This latest slide began in mid February, and we've had our geotechnical engineers from Nashville out to the site twice." Flynn said engineers first did a visual assessment and followed up with exploratory drilling, concluding that the failure was located in front of an existing row of soldier piles installed more than 20 years ago and adjacent to a soil nailing project completed in 2015. Dement will have to excavate half of the road from the center to the outside edge and install a "soil nail" wall to shore up and hold the remaining road, TDOT officials said. Soil nails are 30- to 50-foot hollow steel tubes driven almost horizontally into the earth and grouted in place. Then crews will install a "soldier pile" wall on what will be the new outside edge of the road, according to officials. Soldier piles are solid steel I-beams driven down into the ground to help with soil retention. When the soldier wall is finished, Dement will backfill behind it using graded solid rock with drainage installed as needed. The last steps will include paving, guardrails and striping. Contact staff writer Ben Benton at bbenton@timesfreepress.com or on Twitter twitter.com/BenBenton or on Facebook at www.facebook.com/ben.benton1 or 423-757-6569.